I’m rather irregular with my bike maintenance schedule. It’s often driven by noticing something isn’t quite right and needs attention or new parts. Today’s bike maintenance day was a combination of both. The 5 speed Sturmey Archer hub had been playing up. I’d been missing 2nd gear, something broke on my last trip to Skye, so I’d put in a warranty claim and received the complete internals to replace the faulty one. Fairly straight forward to replace this. After some deliberation when I realised I didn’t have the right tool, I resorted to hammer and cold chisel and remove the old part. After that it all went smoothly, new part in and gears set up again without any hassle. Next task was fitting new mudguards, nice set of new silver Oxford Mudguards bought from BikeTown. Alloy mudguard stays are the business, cut to size with cable cutters. Then I oiled the chain who which I’m reticent to admit was rather dry! Note to self – lube it or lose it. After that a quick clean and this bike is all OK for commuter duties next week. The chain on this bike hadn’t looked as if it was sitting in the teeth of the chainring ok, a quick check with the chain measuring tool confirmed this, so new chain and 7spd freewheel bought. The old freewheel came off easily enough. Oh now what’s that wobble? 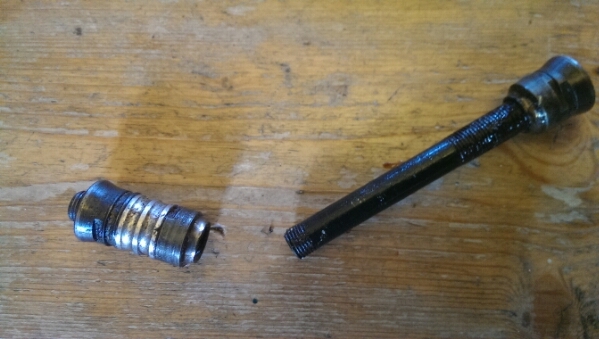 A bit of play in axle – check the photo – metal fatigue. I’m feeling very glad I got home from my last run on this bike safely as I know I was well over 50kph coming down the Crow Rd. So today’s tasks remain unfinished until I source a replacement axle. Maybe a wee trip out to see Big Al at Wheelcraft in Campsie Glen is warranted now, although never on a Sunday as that’s the day Big Al goes cycling.